TMK-TAGMET Taganrog overcame two matches to one defecit to beat Spanish UCAM Cartagena in Admiral Arena in Russia. In Men's ETTU Cup Cajasur Priego TM suffered at home against Sporting Clube De Portugal. 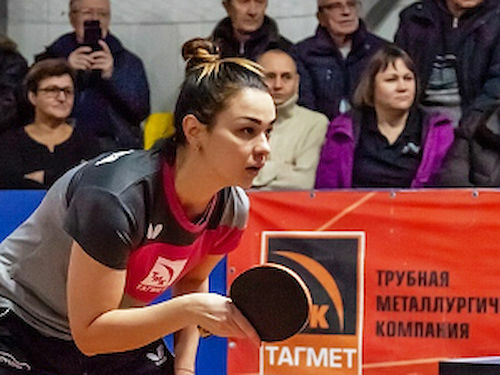 Yulia PROKHOROVA beat Victoria LEBEDEVA in straight games to open first leg encounter, but Maria XIAO leveled. She beat Margarita FETUKHINA. Silvia ERDELYI DE SOUZA gave hosts the lead after she accounted for Valentina SABITOVA. However PROKHOROVA and FETUKHINA showd no mercy and overcame Maria and Victoria. Cajasur Priego TM will have very difficult task in February against Sporting Clube De Portugal. At home soil, only Andre SILVA scored agaist Diogo CARVALHO. Quadri ARUNA won both his matches and Bode ABIODUN aded another victory to the score.